The no Moon day in the month of Ashwayuja or the Aswayuja Krishna paksha Amavasya of the lunar calendar is celebrated as Diwali. The name of the month as far as the Tamil calendar is considered is Aipasi. Diwali of this year will be celebrated on Wednesday, 11th November, 2015. Diwali originiated from the word Deepawali or Deepavali. Deepavali in Sanskrit means a row of lights. Deepa is lights and Vali means row. People would decorate their house with rows of lights on Diwali. Even business establishments would decorate their shops with lights to welcome Goddess Lakshmi or Laxmi. Diwali is celebrated on the occasion of Lord Rama returning to Ayodhya along with Sita and Lakshmana after killing Ravana in North India. In South India, Lord Krishna is supposed to have killed demon Narakasura with the help of his wife Satyabhama on Diwali. The common rituals of Diwali are taking head bath early in the morning after applying oil to the body. The applying of oil is a ritual which originated from the belief that Goddess Lakshmi or Laxmi resides in oil on Diwali. Firecrakcers are burnt early in the morning and a special sweet is eaten before eating any thing on Diwali. 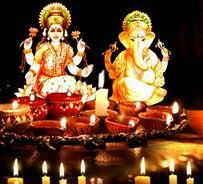 The house is well cleaned and decorated with lamps to welcome Goddess Laxmi or Lakshmi. Business establishments would clean their shops and get them painted if possible and decorate them for welcoming Goddess Laxmi. In the evening Laxmi Puja is performed in houses and business establishments, and both are decorated with lights to the maximum extent. The lighting is supposed to show the way to Goddess Laxmi into the house or shop. Firecrackers are burnt in front of houses and shop with enthusiasm. In few places of the country Diwali is the day of opening of new account books for business establishments. Diwali is the start of new financial year. Sweets are distributed among friends and relatives on Diwali. Gambling is also a ritual in some parts of the country and playing cards is a common practice. All the family members sit together and play cards on Diwali.